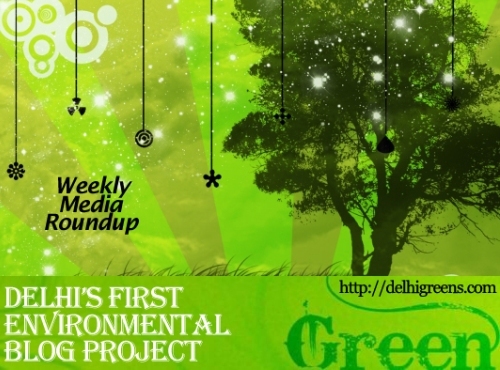 Weekly green news roundup from across different media networks for week 37 (between Sept 7 to 13) 2015. The National Green Tribunal on Friday directed Delhi government to ensure that no trees are cut on the service lane in East Delhi’s Yamuna Vihar area. The National Green Tribunal on Friday directed the Delhi government and all public authorities to produce complete records on installation of sewage treatment plants in the capital. The National Green Tribunal today directed the Delhi government and all public authorities to produce complete records on installation of sewage treatment plants in the capital. Expressing concern over the indiscriminate dumping of waste in the city, the National Green Tribunal today directed the Chief Secretary of Delhi to hold a meeting within a week on the issue of landfill sites in the national capital. One hundred and two saplings of 10 varieties from six countries were planted on Saturday in a specially created Palm Corner of the Commonwealth Park here that is already home to saplings of different varieties from 20 countries. Traffic police have requested civic bodies and Delhi Jal Board to conduct a survey of all water lines running below the main roads following three instances of cave-ins on major stretches due to a rupture in the pipes. Unauthorised harnessing of groundwater for construction purposes has caught the National Green Tribunal’s attention which has issued notice to 14 builders in Delhi-NCR for extracting water flouting rules. Despite being one of the highest polluted cities of the country, Delhi may lag behind in getting green vehicles to its streets. With rampant concretisation taking a toll on trees in Delhi, the National Green Tribunal on Thursday came down heavily on the Delhi Development Authority which had slept over the task of preparing a report on de-concretisation for over a year now. Delhi government’s draft water policy is expected to see major changes after civil society groups raised concerns about certain critical issues being left out from the document. Believe it or not, rising groundwater level in parts of southeast has caused flooding of basements. The Haryana government may end up destroying the water recharge zone for Delhi, Gurgaon and Faridabad if it goes ahead with its plan of landfilling quarry pits near Pali village in Faridabad Aravalis. Struggling to arrange for funds for Yamuna clean-up, the Delhi government-in a first-has decided to turn to private players who would be tasked with reviving the once fabled river on an annuity model. The National Green Tribunal on Tuesday asked Tata Motors and Ashok Leyland, which supply buses to Delhi Transport Corporation, why these vehicles caused noise pollution on roads and directed them to submit details, including their designs. The National Green Tribunal today rapped Delhi Police for not providing complete details on the alternate routes for commercial vehicles passing through the city to decongest the roads. There will be no respite from the mile-long traffic jams on Rao Tula Ram Road stretch in south Delhi, at least till 2017. The National Green Tribunal on Tuesday came down heavily on Noida and Greater Noida authorities for their failure to restrain builders from extracting ground water and constituted a committee to conduct surprise inspection at construction sites in Delhi-NCR. Burning all the world’s deposits of coal, oil and natural gas would raise the tem perature enough to melt the entire ice sheet covering Antarctica, driving the level of the sea up by more than 160 feet, scientists reported.